Spudmaster Potato Chips for sale. Buy online at Zingerman's Mail Order. Gourmet Gifts. Food Gifts. You say potato, I say amazing. After a long hiatus, the crew at Spudmaster is back in action! While the fun box and huge size caught my eye—some of the chips are six inches long—it’s the details that deserve the attention. They use fresh potatoes only, not frozen. None are “chipping” potatoes, which is industry lingo for a bland potato bred to withstand frying. The scrubbed, unpeeled potatoes are picked for flavor. The cooking times are modified for each batch, just like bakers do. Blanched, spiced, baked and then laid in the bag so they don’t break, Spudmaster chips are an outlier on the potato chip spectrum. 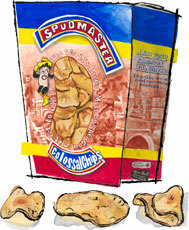 Where most are worried about clever spices, Spudmaster spends time getting the potato flavor right. It works. These chips are cooked in peanut oil.